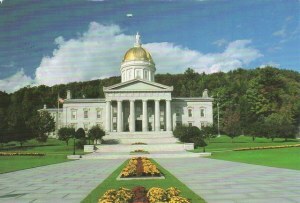 The Vermont State House, located in Montpelier, is the state capitol of Vermont, United States and the seat of the Vermont General Assembly. The current Greek Revivalstructure is the third building on the same site to be used as the State House. Designed by Thomas Silloway in 1857–1858, it was occupied in 1859.